Beautify your yard with one of our specialty structures. Choose from topiaries, trellises, arbors, even a pergola! Our professional partners will help us to create a structure you'll love to look at every time you go out into your yard. Topiary is the art of creating sculptures out of trees or shrubs. The word derives from the Latin word for an ornamental landscape gardener, topiarius. A trellis is an architectural structure, usually made from interwoven pieces of wood, bamboo or metal, made to support climbing plants. You might see sweet peas, grapevines, ivy, or climbing roses on a trellis. 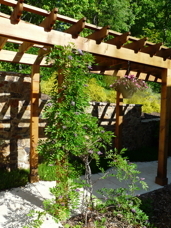 An arbor, or pergola, is a garden feature forming a shaded walk or passageway of pillars that support cross-beams, and a sturdy open lattice. The lattice is usually used to support vines of some type. Grapes are often grown on arbors of pergolas, but there are many different types of plants suited to growing on this type of structure.